Faced with more than 200 innovative companies, the Swiss company Limmex, which developed with the Swiss Center for Electronics and Microtechnology a watch emergency call, received first prize in the "M2M Challenge" at Mobile World Congress . Competing with more than 200 companies from 44 countries, the Swiss company Limmex won the "M2M Challenge" (in the field of communication "Machine-to-Machine") at Mobile World Congress in Barcelona, ​​a competition organized by Ericsson. 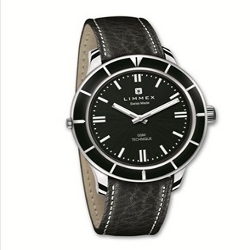 Limmex has developed a watch at the touch of the crown, consists one after the other numbers pre-recorded personal family members, friends or a central emergency calls, until that a communication is established. This security solution is intended to supervisory staff, athletes, children, people with health problems or elderly people living alone. The basic technology was developed at the Swiss Center for Electronics and Microtechnology. This watch emergency call has attracted the interest of telecommunications companies, which attempts to offer new value solutions to their customers. Limmex already working with Swisscom in Switzerland and Telekom in Germany. Now the company has decided to expand internationally.